Can I change the browser theme? Photos from the Background gallery on your computer or from any website. Videos or dynamic selections of photos from the Background gallery. Click Background gallery under the Tableau to the right. Select a photo or video from an album. Note. You can configure your browser to randomly alternate images or videos from your Background gallery once a day. For one album. Put together a selection in the Background gallery and click Alternate these backgrounds. For all albums. In the Background gallery, click Alternate in the All backgrounds section. Under the Tableau on the right, click → Upload from computer. Restriction. You can only load .png or .jpg files as background images. Open the page with an image. 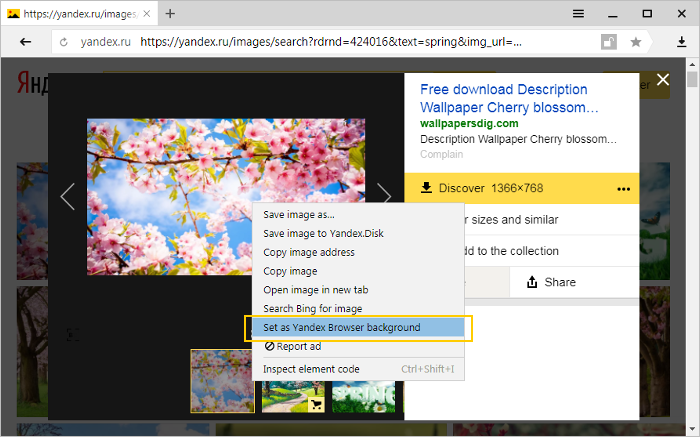 Open the context menu and select Set as Yandex Browser background. Under the Tableau on the right, click and turn off Background animation. 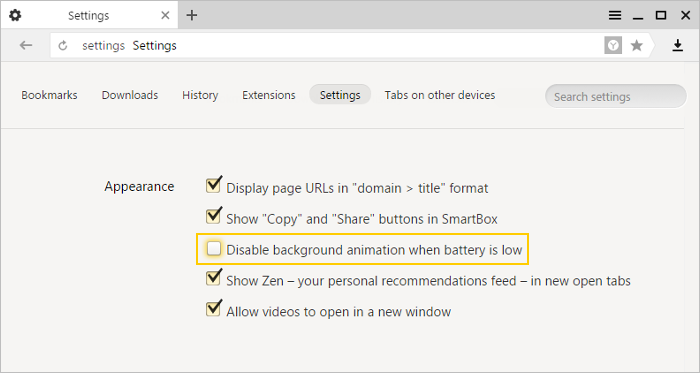 In the Appearance section, turn off the Disable background animation when battery is low option. 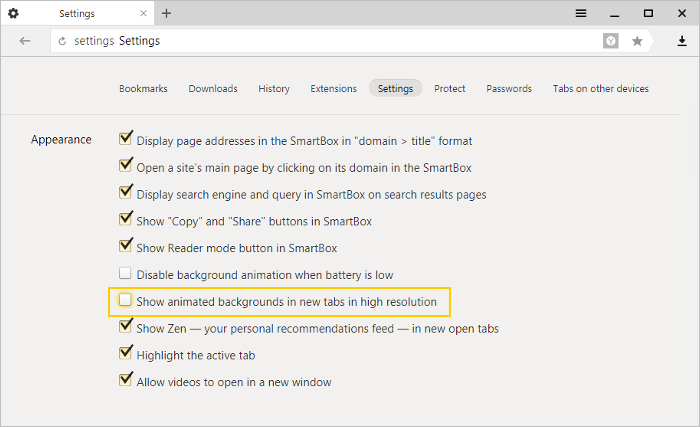 In the Appearance settings, turn off the Show animated backgrounds in new tabs in high resolution option. Under the Tableau to the right, click and turn on the Background animation option. Right-click the name of your video card. If your animation re-appears, try going through your extensions one at a time to find the blocking one. Clear your cache so that the browser doesn't load a copy of the page that was rendered earlier and contains the blocked animation. If these recommendations don't help, contact our support staff using the feedback form. Describe the situation in detail, and attach a screenshot if possible. Open the file search field in Windows. and paste it into the file search box. 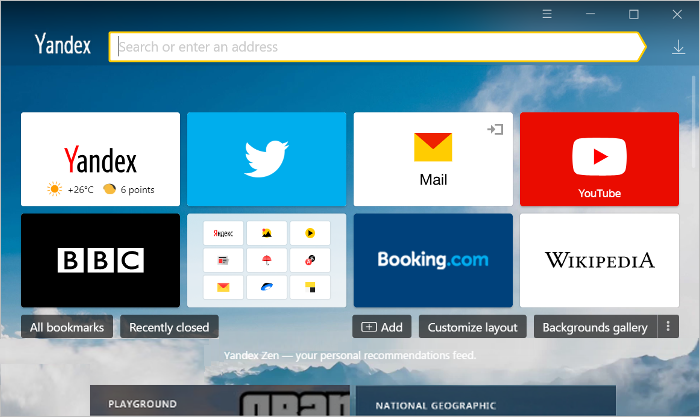 Yandex Browser does not offer different themes. Themes uploaded from the Chrome Web Store are not compatible with Yandex Browser. 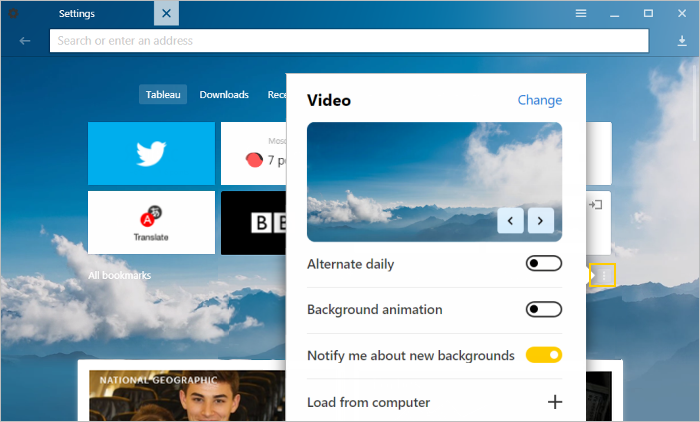 However, you can customize your browser background by selecting from a Gallery of photos or videos or uploading your own image as a background. 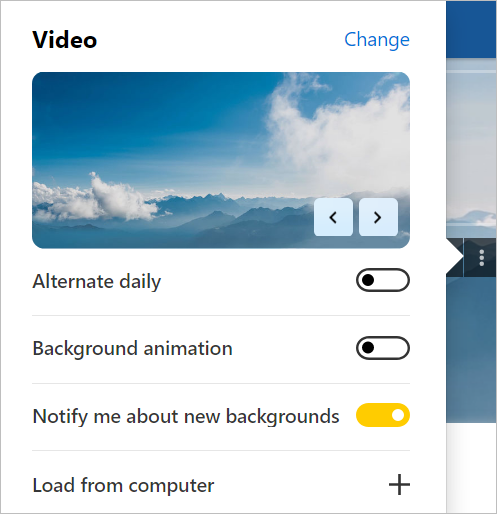 Change the browser backgroundBackground animationBackground animation doesn't workThe background doesn't change on the Tableau pageCan I change the browser theme?